I mean, I’m certainly not the fastest guy on the trails, but I’ve got more trail running cred than most of the racers here. After a full summer of big runs in the mountains, throwing down thousand-feet-per-mile grades off trail at five-digit elevations, a marathon with only a couple of moderate climbs should be a nice, relaxing, birthday-season desert frolic with friends. Rawr! Kendal is a great person. 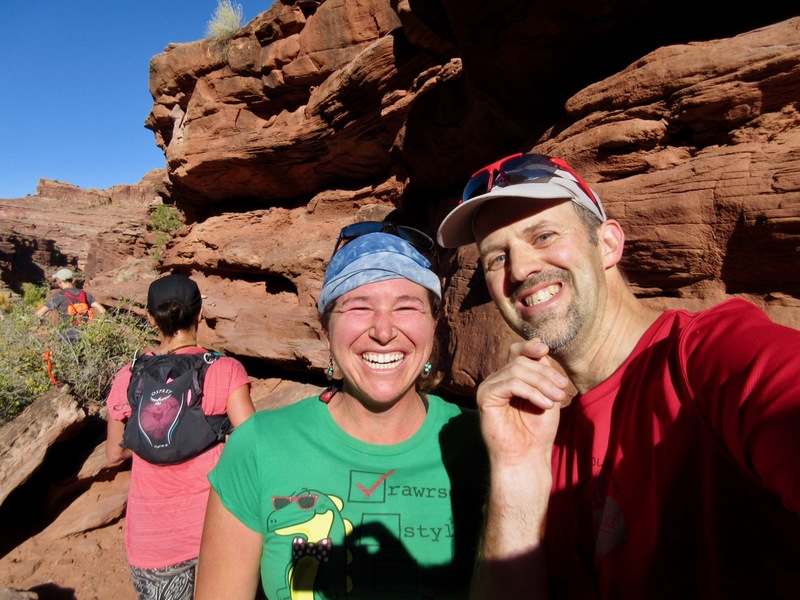 I’d journeyed out to Moab with Nate, Annie, Jesse, and a bunch of other like-minded runner idiots for a little, casual trail racing at the well-reviewed Moab Trail Marathon. It’s a big race! There were about 800 people in each of the marathon and half-marathon distances which are run concurrently. Heck, there were even starting waves of about 200 people each. It’s the USATF trail marathon championship, so there were some big guns of trail running out there. I conservatively put myself in the fourth wave figuring on about a 5-hour finish. Wedged in there amongst all the other runners in the first mile or two up Pritchett Canyon on the south side of the Colorado River, I was definitely feeling smug. All these people were carrying way more gear than they needed for a supported race in good weather. Heavy coats, fully-loaded running packs, some were even wearing the (cotton) race shirt in the race! How gauche! I bet this is the first time these people have ever run on trails in their lives. Sheesh. Starting line at the Kane Creek road. Climbing up Pritchett Canyon, still very runnable. More Pritchett Canyon goodness as the crowd starts to thin out a bit. Small arch at mile 4. Sand pits and slickrock ledges were obstacles, but mainly it was the other runners ducking and dodging around each other which provided the main hazards to navigation. I set a conservative but focused pace for the first four miles as we climbed through mostly-runnable terrain and broke into the sun. The last half mile climb up to a pass was legitimately steep, but I was feeling good and moving well. Hmmm, maybe I’m in better shape than I thought. Certainly I’m passing people who started in earlier waves by now. Nice doubletrack on the way to the 6-mile aid station. The trail quickly transitioned to smooth descent on double-track through sunny desert scrubland to the aid station at mile 6. As all the newbs pulled in, unpacked their running vests, and set about re-provisioning (wasting time! ), I topped off a bottle, grabbed a handful of chips for now and a gel for later and moved out. Total stopped time, maybe 20 seconds. Running a smart race! 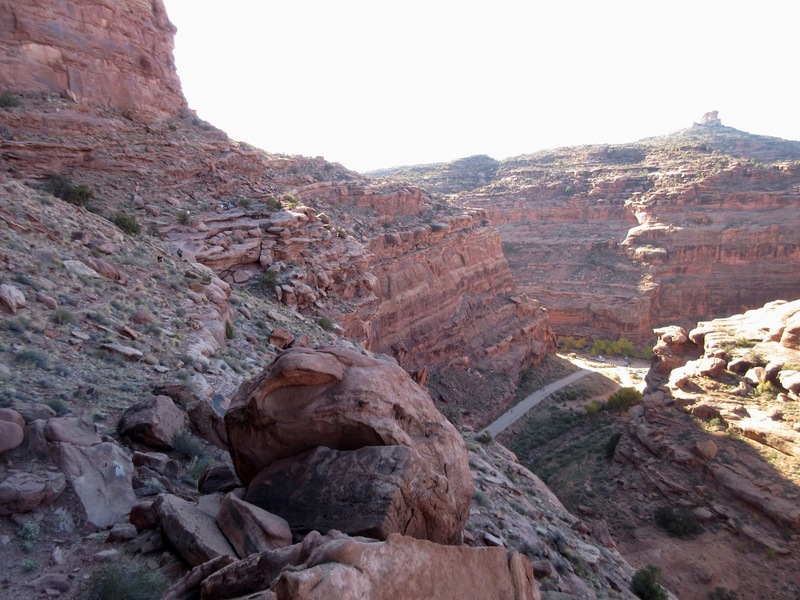 Hunter Canyon Rim at mile 8 is spectacular! The course turned back to the north and got a bit rougher, but still it was quite runnable. The herd had thinned out considerably, but there were still plenty of people to pass. By mile 8 the course was, even to my jaded sense of running scenery, flat-out spectacular: a wild traverse across the top of Hunter Canyon (runners down in the canyon showed we’d be down there in a few miles). I passed a few half-marathoners who were clearly a bit intimidated by the exposure and technicality of this section of trail. You’ve got to know how to move over this stuff, people. Watch and learn! Watch your ego and watch your footing, in that order. Shortly after this I crashed. Around the corner, the trail wound into a shadowed nook atop a steep slope. This was the start of the really technical descent down into the 10 mile aid station at Kane Creek Road. I was feeling great and was pleased at the smart race I was running and couldn’t wait for the herd to thin farther as the half-marathon people split off along the road while we real runners headed left for another 16 miles of trail. Okay, peripheral nerves, what’s the situation? Both legs hurt a lot, particularly the right knee. Crap, if I’ve broken a leg, this is going to be REALLY BAD in both the short and long term! Sitting there on the trail (not, thankfully, down the cliff), I manage to move my legs. Not broken, just banged up and scraped pretty well. Dammit, I was having a really good race. Can I still finish? I’m definitely shocky and getting buzzy ears and tunnel vision. 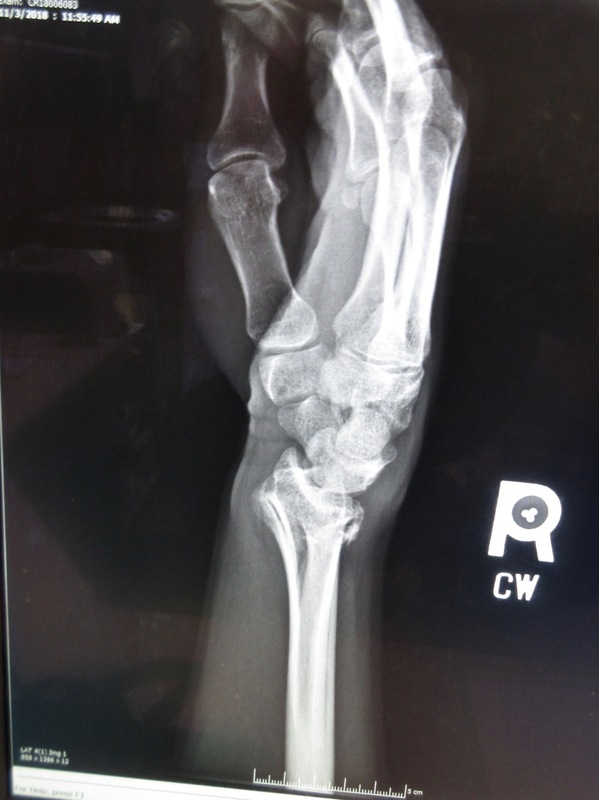 Something’s definitely broken… oh, hey, are wrists supposed to be that shape? Can I still finish the race? Well, maybe… NO. I’ve never DNFed a race before, but a wrongly-bent arm (not to mention a banged up knee) definitely is an unambiguous sign that it’s time to drop from the race. Kendal is a great person. Rawr. From the point of view of the runners I was trying to pass, it must have been a strange sight to have some large, rude, ego-stuffed jerk-face come plummeting out of the sky and crash in their midst. Suddenly they were around me, checking for concussions, getting me sitting against a rock off the trail, and going ahead to the aid station for help, despite the fact that I was a large, rude, jerk who thought I was superior to them and couldn’t wait a few minutes in this very challenging terrain. Particular thanks to Kendal Smith of Telluride who escorted me down the worst bits and was the nicest epitome of selfless trail running esprit de corp that anyone could want. I think of her now as a role model. A quarter mile later, we went through the aid station and I was handed off to the race medic, thence to a series of county sherifs who drove me back to the start line, and then race director Danelle Ballengee’s husband who amiably drove me to the Moab ER. That smile is entirely the drugs. I was looking at a month, minimum, of significant inconvenience when it came to everyday living. The Moab ER has a great sense of humor. I’m one of those yellow pins. 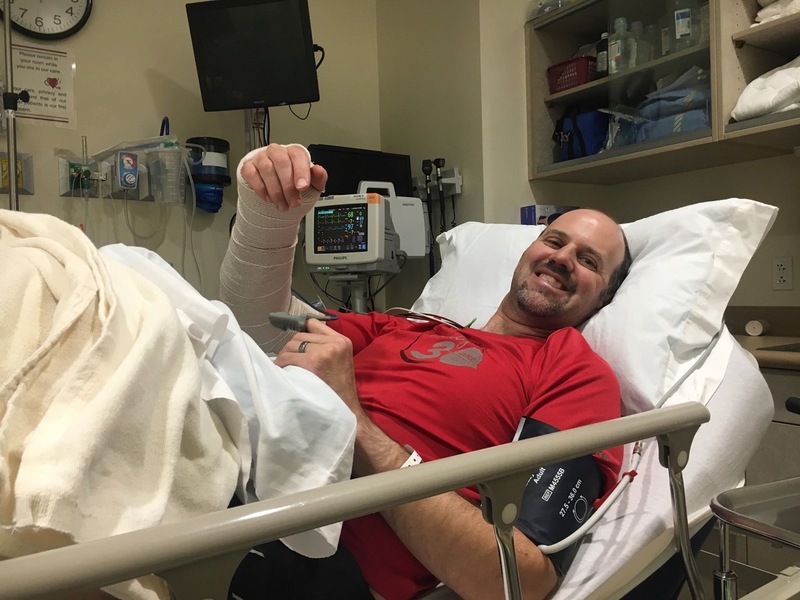 A week later, after a challenging drive home with Jesse and an unplanned night spent on the wrong side of the mountains due to blizzard, I had surgery to install a metal plate in my arm. My fracture was described as “magnificent”, so this bit of permanent hardware is there to hold the distal end of the radius at the proper angle so that it can heal properly. 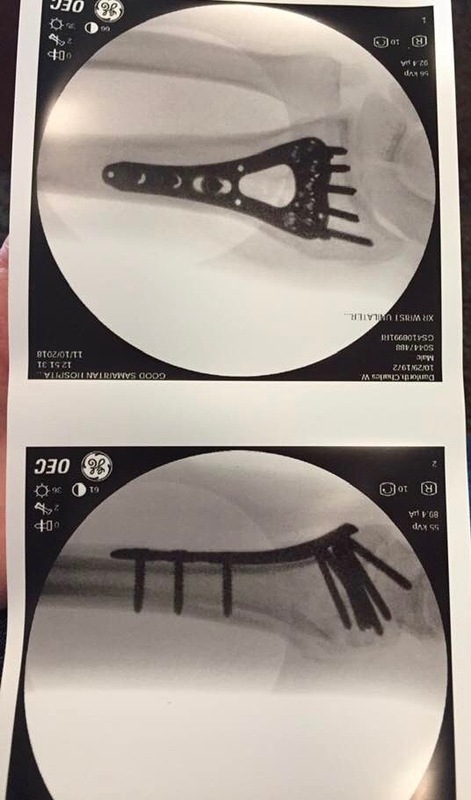 It isn’t such a big deal, but it sure looks gnarly in the X-rays! Once the post-surgery drugs wore off… then it hurt! I’ve still experienced worse, but yow! I’m more machine than man now. I’ve had plenty of time to think as I’ve recovered. As injuries go, this is neither my best nor worst broken arm (though my first as an adult), nor is it a problem on the scale that keeps me from at least some variant of my work and family duties. I am, of course, right handed and I’ll give you one guess which arm is broken. Being one-handed is fascinatingly frustrating and difficult. Seriously, everyone should try binding your dominant arm across your chest and going through your life for a day or two. There are plenty of obvious challenges (writing, typing, tying shoes, opening jars), but plenty of others which came as a surprise: zip-lock bags (possible, but took me about a week to figure out the trick), brushing teeth with the wrong hand (deeply weird), buttoning pants (very pants-dependent), buttering a slice of bread (basically impossible). Even finishing a meal is tricky (try it sometime with only one hand). As I write this one month after the injury, I’ve recovered to the point where I can more-or-less type and use my right hand for a lot of things. When the cast came off, it wonderful! It’s pure heaven to feel air on your skin again and be able to shower, but everything feels very weak, wobbly, and vulnerable. The challenge is now stopping myself from trying to do normal things with that hand (opening doors and jars) that it still can’t do. It will be a few months yet until I regain full dexterity in my right hand. I’ve been cleared for running (but not for falling), so I snuck in a very timid, very slow run a few days ago and it was really great. Ski season has started and I hope to manage some gentle turns in the next week or two. Slowly life is getting back to normal. So, check your ego, both in racing and in anything else you do. I’m proud of what I’ve done in life (thus my blog), but pride must be tempered with humility. This experience has been a lesson in the need for humility and patience and what happens when pride gets out of control. Many thanks to Nate, Annie, Jesse, Kendal, and all the other people who picked me up and dragged me across two states back home. Thanks to the various medical folks both in Moab and Colorado for doing a speedy and thorough job of getting me patched up. Thanks, as always, to Amy for her usual cool-in-the-face-of-complications nature for doing the family heavy lifting while I’m broken. At the bottom of the nice shwag bag they handed out at the race is a little yellow coupon with a code for 15% off next year’s Moab Trail Marathon. I’ve put it on my calendar already (and you should too!). But this time, I’ll run as a more humble and grateful person enhanced with a chunk of surgical stainless in my arm. And because of that, maybe I’ll get to see the second half of the course. I hear it’s very nice. 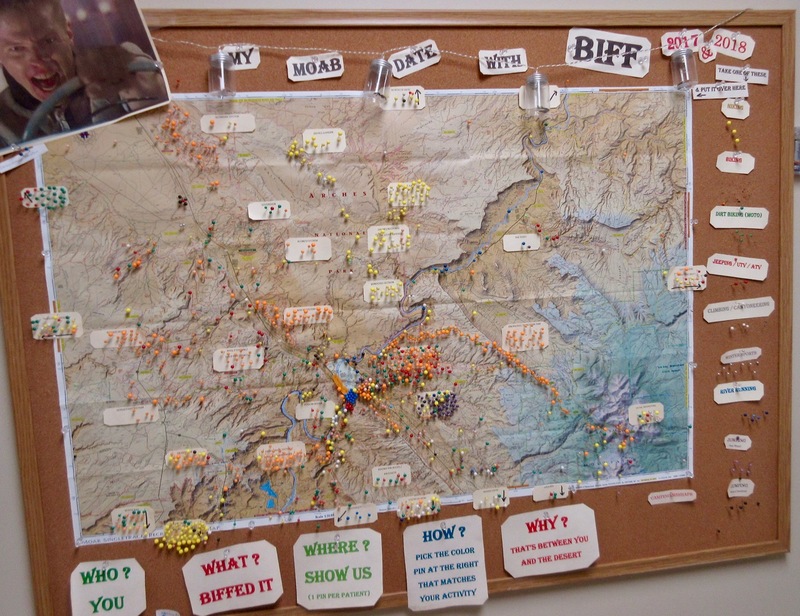 This entry was posted in race, running, sedentary and tagged crash, distal radius fracture, hospital, hunter canyon rim, marathon, moab, moab trail marathon, pritchet canyon, race, utah. Bookmark the permalink.